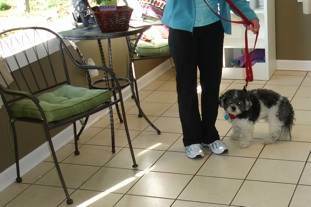 Pets arrive for check-in between 8 a.m. and 10 am. I request that Cat haircut appointments are made in the afternoon and early evening. We discuss the desired service and haircut style, as well as any special needs and give an estimated pick up time. Next, the pets are in the crate to relax and wait while other pets are dropped off. This is not a long wait…. 45 minutes to 1 hour at the most - before they begin the grooming process! (This is the hardest part of the job for me…being an animal lover I naturally feel badly when putting them into the crate.) But, at A Hair of the Dog we continually strive to minimize the time the pets spend in the crate. The pets are bathed one after another from 9:15am to approximately 12:00 or 12:30pm -- as I am finishing from 10:00 am to 4:00 or 5:00 pm. Every dog which is here for 4 hours or more is taken outside to relieve themselves and “stretch their legs” between 12:00 and 12:30. They are given lots of water and any toys or blankets* which are brought from home. Snacks are always welcome, too! *Sometimes the dogs potty on their blankets. If this happens the blanket will be removed and placed in a trash bag and returned to the owner, as we do not have a washing machine. Your pet is then set on top of the grooming table and secured with a “noose” that is wrapped from the back of his/her neck around and under one of his/her front legs ( instead of strictly around the neck.) I practice this technique to avoid any safety concerns, though rest assured, pets are never left unattended! Their nails are trimmed and ears are cleaned, and if a tooth brushing has been requested I will brush their teeth as well. A Hair of the Dog makes sure your pet receives a SPA experience. 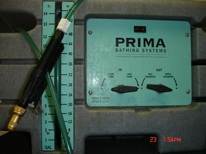 We use a GREEN “Prima Bathing system” which delivers a powerful spray mixture of all natural shampoo and conditioners massaging the pets skin to release natural oils and extract out dirt and bacteria from their pores, all the while reducing water usage by 80%. Next, your pets soak in the shampoo mixture for a minute or two and are rinsed with warm water. After they’ve been fully rinsed and towel dried it is time to spray off the remaining water using what is known as the “air force” dryer. The air force device is a drier that is similar to what we use to dry our hands in some public bathrooms. It’s a powerful hose drier that that is the equivalent to 40 mph or less and sprays off all of the water so that your pet is left mildly damp. Surprisingly most dogs are perfectly fine with this drying method, although some do not like it. If your pet doesn’t care for the drier at all then he or she will only be towel dried. To finish drying your pet, he/she is put into a crate. Attached to the front are 1 to 3 hose driers which blow room temperate air that does not dehydrate or heat the pets. Small pets dry for about 20 to 30 minutes while larger pets require 45 minutes. After your pet is completely dry, he/she returns to the grooming table to receive their breed specific professional haircut. When finished, I call the owner to notify you that your beloved pet is clean, looking cute and ready to return home!